Today is a historical day for Microsoft, and not just because they released their latest operating systems (the various flavors of Windows 8 and Windows RT). 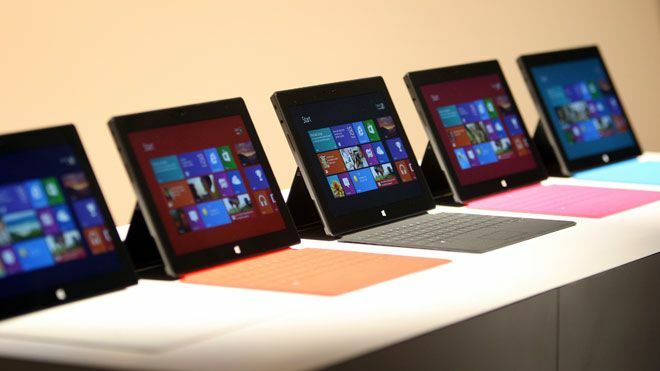 By also introducing their “Surface” tablet device, today marks the first time that Microsoft has produced a computing device of any sort. For all the devices that have run Microsoft operating systems and software, Microsoft has never made PCs, never made laptops, never made smartphones, and up until now, had never made a tablet. The Surface represents a huge step for Microsoft’s future, but the important question for those planning technology purchases remains – what does Microsoft’s future hold? And how does the Surface play into that future? At this point, Microsoft’s future is quite uncertain. For as large of a company Microsoft still is, all of their strength lies in the PC market. However, the PC market is shrinking rapidly, largely being replaced by mobile devices such as tablets and smartphones. Mobile devices won’t completely eliminate the PC market, but it will reduce it down to a size that will likely not support a company the size of Microsoft – at least not in the manner they are accustomed to existing. So while Microsoft is in no immediate danger of collapsing, such as a company like RIM, their future 5 years out is shaky at best. Microsoft’s only chance of remaining a dominant company in the future is to compete successfully in the mobile device market. Up to this point, Microsoft has had no success at all. Windows 8/RT is Microsoft’s attempt to bridge their dominance in the PC market into success in the mobile device market. The Surface is Microsoft’s attempt to inject a level of control over an entire platform, both hardware and software as Apple has successfully done. The strategies are independent yet intertwined. If Windows 8 and RT are wildly successful on their own, it will prove that the Old World Technology paradigm of one company making software for a plethora of hardware vendors can still be viable. However, it appears that Microsoft is hedging their bets and getting their feet wet with hardware manufacturing. If Microsoft’s hardware partners can’t make inroads into the dominance of Apple’s iOS devices and Google’s Android-based devices, then Microsoft’s last hope will be to offer consumers a 100% Microsoft solution, one in which they control all aspects of production and, perhaps more importantly, marketing and promotion. The next few months should give us a good indication how successful Microsoft’s strategies will prove. Unfortunately, even today at day one, it seems they are already off to a rocky start. So far early reviews have been mixed. The general consensus is that while Microsoft’s Surface may have strong hardware specs, the software leaves much to be desired. Too many inconsistencies and missing features plague the new Windows RT platform. While Microsoft could afford to release subpar products into the PC market, they are not afforded the same luxury in the mobile device market. Consumer expectations are set very high due to the ease-of-use and robustness of Apple’s iPhone and iPad. Consumers and small business owners are not as forgiving of flaws as are corporate IT departments. These flaws could very well hurt Windows adoption on the mobile device front. Given the rapid pace of technology development and the speed at which products come and go, a slow start is a bad sign for a mobile device platform these days. If Microsoft strikes out with Windows on a mobile platform now, they may be relegated to a third-place also-ran, behind Apple and Google. Microsoft is betting that those people who currently are still tied to Microsoft on the PC will hold out for Microsoft on mobile devices. While that’s Microsoft’s only bet, it’s not a good bet for consumers and small business. The mobile device market has established itself without Microsoft and will continue to entrench itself over the next few years while Microsoft is still figuring out how to catch up. I can not recommend that any small business wait to see how Microsoft fares in this market. The longer any business waits to jump into The New World of Technology, the further they fall behind their competitors who are embracing it. Waiting for Microsoft to get their act together is time that most small businesses simply can’t afford.